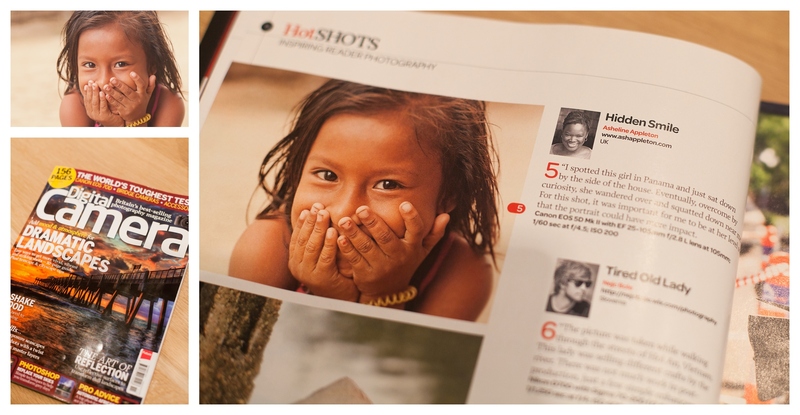 Back in November, I was so pleased to see my travel portrait of a little indigenous Panamanian girl “Hidden Smile” featured in the UK edition of Digital Camera magazine. This got me thinking about the story behind the shot and reopened the can of worms surrounding paying for travel images. After a hectic schedule in Panama City, it was great to spend quality time in Comarca de Kuna Yala on the Caribbean coast, with a close friend living in Panama. After a couple of days of much needed rest and relaxation, we headed out to visit the indigenous Kuna people on a nearby island. Fast-forward two hours and I’m crouching in the shade dehydrated, dispirited and distracted, scanning through the hand full of mediocre images on my camera. The only light relief is in the form of a curious little girl, with mischief in her eyes, daringly shuffling closer and closer to me. The Kuna have successfully commercialised access to their culture and why not? They have a commodity that tourists are willing to pay for. Not every one agrees though; many professional travel photographers are vehemently against paying for travel images for a host of reasons: you don’t get ‘authentic’ images; cash for photos ‘spoils’ it for the next guy; and the local culture gets distorted/‘westernised’ when cash changes hands. I question this attitude. If you are shooting travel portraits that enhance your portfolio, win you work and increase your profile, is it fair to expect to always get away without paying? Does handing out pens or notebooks compensate more often than not, disadvantaged communities looking to feed their families and educate their children? When you do the maths, what the old Njemps fisherwoman in Baringo, Kenya, is asking for is equivalent to the cost of a cappuccino back home. Of course the payment dynamic varies depending on whether you’re dealing with a full-blown commercial operation in the Omo valley, southern Ethiopia; or a random encounter with a lone rice famer in Ubud, Bali, who’s just after few coins. Admittedly, it is incredibly challenging to shoot ‘natural’ portraits when you’re at the sharp end of a hard-nosed business transaction, which explains my frustration on this particular trip. In the ideal world we all want to make images resulting from genuine connections, where there is no expectation of payment or feelings of exploitation. However much we want this though, can never justify disparaging canny entrepreneurs who expect to be paid for being on the other side of our cameras. 2 Responses to Travel Images: To Pay or not to Pay? Is that the Question? You’re right of course Josh, in an ideal world. The reality for us photographers, though is, that culture has become a commodity, the people we photograph are not naive, they know the currency their images have.